Bruce Banner has experienced a revelation. Banner has finally come to realize that The Hulk is incurable. Because of this revelation Banner has made a decision. Rather than spending endless amounts of time trying to cure himself, he's decided to put his mind to creating scientific breakthroughs. 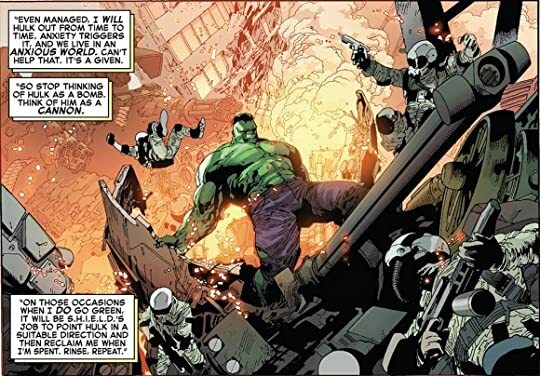 To do this he's made a deal with SHIELD Director Maria Hill to use Hulk as a cannon in exchange for a top notch lab and funding for his scientific research. So The Hulk has become an Agent of SHIELD. I have to say I love the concept going on here. Bruce Banner making a deal for both of his personalities to benefit SHIELD is brilliant and honestly it's surprising this idea has never been considered before. A lot of thought went into the story and I'm excited to see where it leads. The story is so cool that The Hulk has made friends in surprising places.